Module 1 explained the mechanisms and functions of haemostasis, and of the importance of the balance between coagulation and the dual processes of inhibition and fibrinolysis. Module 2 considered the pathology of arterial thrombosis, and the use of antiplatelet agents to treat or prevent this. In this module, we focus on anticoagulant therapy – pharmacological intervention in the coagulation cascade. This is of central importance in treatment and prevention of thromboses which form under conditions of low shear – venous thromboembolism. In cardiology, it is used in three main situations: atrial fibrillation (AF), acute coronary syndromes (as an adjunct to antiplatelet agents) and heart valve disease. But before we look at these conditions, we must review the coagulation cascade. The ‘extrinsic pathway’ involves tissue factor and factor VII, which together form a second complex to generate factor Xa. This is the main pathway by which coagulation is activated in vivo. The ‘intrinsic pathway’ sees coagulation factors XII, XI, IX, and VIII come together to form a complex that results in the conversion of factor X to activated factor X (that is, factor Xa). As a pathway for activation of coagulation this probably has minimal importance in vivo. However, factors VIII, IX and XI have crucial roles in amplification of the cascade. 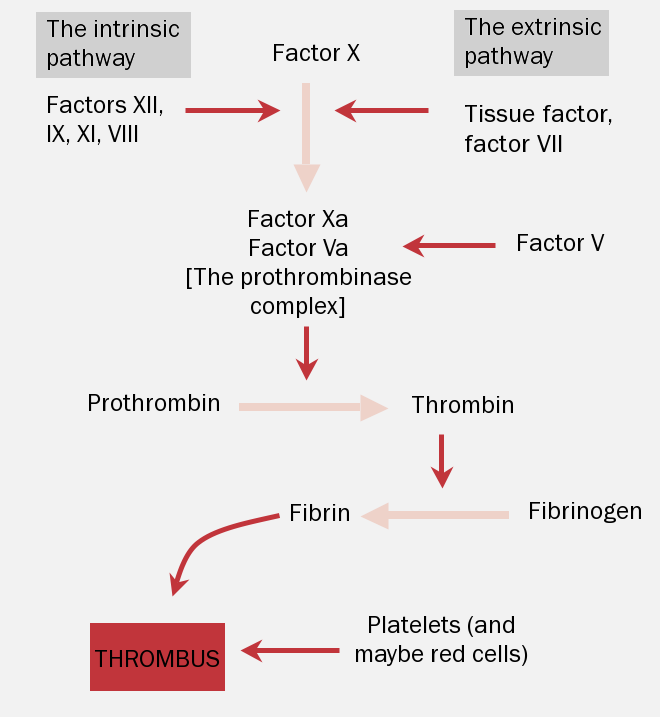 In the ‘common pathway’, factor Xa combines with factor Va to form the prothrombinase complex that converts prothrombin into thrombin. This, in turn, generates fibrin from fibrinogen. Once stabilised by factor XIIIa, fibrin combines with platelets (and often with red cells) to form a thrombus. Anticoagulants interfere with this process to prevent unwanted activation of the clotting cascade. A number of agents are in use, ranging from long-established heparin, low molecular weight heparin (LMWH) and vitamin K antagonists (VKAs) (of which warfarin is the principal agent) to the newer, non-VKA oral anticoagulants (NOACs) dabigatran, rivaroxaban, apixaban and edoxaban. We will consider these agents and their therapeutic indications in this module. Module 4 will look at some of the clinical aspects of their use.